View detailed information for a subscriber (email address). See which lists a Subscriber is on. 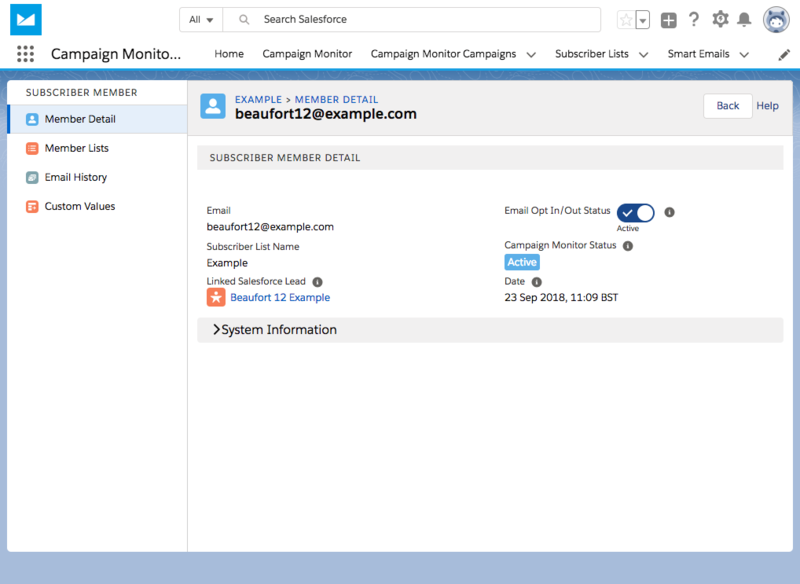 View Salesforce values stored in Campaign Monitor for a Subscriber. From the related list on a Contact or Lead you can quickly see the name of the subscriber list and their current state i.e. active, unsubscribed or deleted. A Contact or Lead can be on one or more lists. Add Contact/Lead to Subscriber List - Click this button to add the record to one or more subscriber lists. 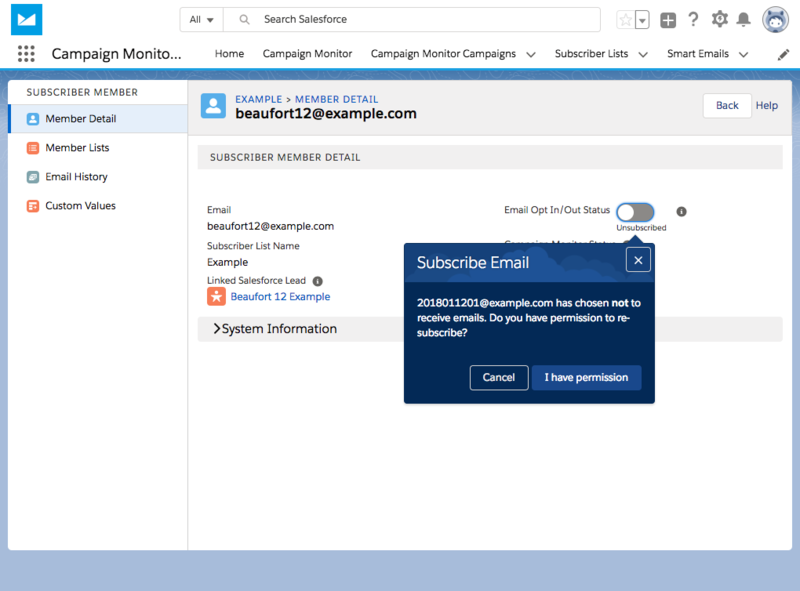 View Contact in Campaign Monitor - Click this button to view subscriber details directly in Campaign Monitor. Unsubscribe All - Click this button to unsubscribe a person from all lists. Here you can see if the record is linked to a Salesforce contact or lead and their current subscriber state. You can also manually change a person subscriber state. This sets the Email Opt In/Out status within Campaign Monitor. Typically this is on a per list basis - this can be configured via the 'Unsubscribe settings' on the subscriber list. This overrides the Salesforce 'Email Opt Out' field. This shows you any other lists this subscriber email address is linked to and their current status. This screen shows any associated tracking email statistics for all lists, this can be filtered by the list your email campaign was based on. In addition to standard campaign data, you will also see tracking from Campaign Monitor journeys. Currently, Campaign Monitor API does not allow tracking data from Journeys to be pulled back in batch. To observe Salesforce limits we visualise the data in Salesforce instead of storing it. Your subscriber list can contain custom fields. This screen shows you what values are stored in Campaign Monitor for this list.